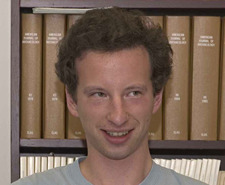 Lev Blumenfeld received his undergraduate degree in linguistics and classics from the University of Wisconsin-Madison, followed by a PhD from Stanford in 2006. He spent 2006-2007 as a visitor at UC Santa Cruz, and has been at Carleton University in Ottawa, Ontario ever since. His main interests are theoretical phonology and generative metrics, with an empirical focus on English, Latin, and Russian. Recently he has been doing fieldwork on the phonology and morphology of Nauruan, an Oceanic language spoken in the Central Pacific.